2nd century BC - 2nd 1st cen. AD. 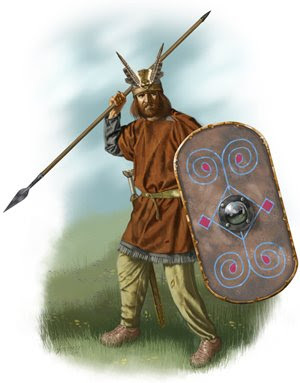 Early 1st century AD Batavian German warrior illustration courtesy of Johnny Shumate. There were numerous germanic tribes that warred with each other just as frequently as they warred with Rome. They were unified by a common tongue and similar culture, but never formed a unified state. Unlike Gaul, the german lands were not wholly conquered by Rome. The first emperor, Augustus, had grand plans for an invasion of Germania. However, that dream died in in 9AD when Varus lost 3 full legions and supporting auxiliaries. For the rest of Roman history, the land east of Rhine and north of the Danube rivers remained primarily in barbarian hands. 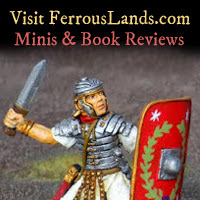 The legions would, of course, make retaliatory raids into the german territory, though it seems the Roman idea was to man only enough land on the far side of the Rivers to create a more defendable border. The kingdom of Dacia was indeed conquered and made a province at the beginning of the 2nd century. However, this land north of the Danube was controlled by a people of Celtic, Thracian, Scythian stock—considered to be separate people from the germans. According to Tacitus, the strength of the German warband lay in its infantry. Each warrior carried several javelins. Cavalrymen were equipend similarly, with only a very few armored. The quickest men were formed into units of a regular size of 100 men. They occupied the front rank, following the cavaly. Tacitus was not especially impressed by the quality of german cavalry, yet Julius Caesar employed them to great effect in his wars. Cavalry were not meant as shick troops to burst through enemy lines. Their main use was in hit and run tactics, attacking the enemy flank, routing fleeing enemy infantry, and protecting the german flank. Armor is nearly absent until the 2nd cen. AD when Roman-made equipment begins to imported on a larger scale. There have been some finds of German shields. See my article on Celtic and German Shields. Their infantry made use of oval, rectangular, multi-sided body shields. Cavalrymen used smaller round or oval shields. Tacitus states that, "...the shields are marked out in very bright colours" Unfortunately, there is no direct evidence for the graphics that may have bee emblazoned on the face of these german shields. Some Roman coins depict german shield blazons. Yet, these designs are even less likely to be accurate depictions than those found on Roman sculpture. The Batavians inhabited an island between the Meuse, Waal, and Rhine rivers in what is now the netherlands. Tacitus says they were the most brave of all the german tribes. They were once members of the Chatti tribe. Many Batavians joined the Roman army as auxiliaries in the late 1st century BC and early 1st century AD. (Wink) In 69 AD the Batavian auxiliary units and tribesmen revolted against Rome. Their leader was the Batavian, Julius Civilus. (Tacitus) This rebellion lead to the Roman practice of posting auxiliaries away from their homelands and prohibiting commanders from being of the same tribe. In the forested lands southeast of the Ruhr River, and north of the Main River, lived the Chatti. Tacitus names it the, Hercynian Forest. They were a well organized and polically strong people able to wage prolonged wars. 1. Wilcox, Peter. Rome's Enemies 1, Germanics and Dacians,. Osprey Publishing, 1993. 2. Wink, Adrian. “Elite Tribal Infantry” from Ancient Warfare Magazine, Issue 1, Vol 1. June/July 2007. I don't remember if this is in Tacitus' Germania, but perhaps he wrote about the self-inflicted wounds or the prestige of scars.